To coin a phrase, once you have reached the top, the only way to go is down, and I am sure that we all have many good examples that prove the validity of such an argument � especially as far as �our� music is concerned. Yes, we all have a favorite band that at some point managed to reach the absolute height of its creative ability only to later on disappear in the thick mist of indifference. Having said that, how many bands do you know that have managed to stay on top of their game and in the period of two years release two brilliant efforts like 'Eclipse� and 'Silent Waters�? 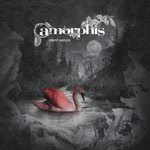 Ladies and gentlemen, without any further ado, will you please welcome�Amorphis! I was certainly not the only music journalist who felt completely helpless in front of the sheer power that the musical masterpiece entitled 'Eclipse� released into our world back in 2006. This �back to the roots with eyes staring at the future� approach that the members of Amorphis chose to follow was indeed quite successful, yet it raised quite a few questions as far as the future of the band was concerned. I mean, what would one expect the next possible/logical step to be � one that would secure the band�s further musical evolution and at the same ensure the outfit�s reputation as one of the most innovative and musically daring that this music has to present? The answer was far simpler that any of us could have expected. The first thought that crossed my mind, the moment I listened to the �Opeth-esque� main riff of the opening track 'Weaving The Incantation� and Tomi Joutsen�s trademark Death Metal growls, was that 'Silent Waters� is the musical continuation of 'Eclipse� and even though there are a few distinct moments throughout this ten track release where such a connection is clearly audible, this album comes across as a more emotional and atmospheric release than its predecessor. There is an easily detectible evolution both in the vocal and the melodic aspects of the band�s music, the direct result of which being that all compositions are blessed with some of the best quality choruses and refrains ever performed by this sextet. Songs as diverse as the Gothy 'Silent Waters� and the Epic masterpiece 'I Of Crimson Blood� are connected by a strong magical bond and blend in perfectly with the more typical Amorphis compositions, such as the dark-sounding 'Towards and Against� and 'Shaman�, which contains a beautiful Jethro Tull-influenced flute theme. Folk music has always been an important source of inspiration for the Finnish outfit, so do not miss out on either the beautifully performed 'Enigma� or the medieval-sounding tunes of 'Black River�, which provide the best ending to this romantic dark �fairytale�. Great albums, like viruses, have similar symptoms: their strong effect can easily penetrate your immune system, they become almost instantly contagious and they manage to keep you sedated throughout their long circle. I, for one, am quite happy to have once again contracted the �Amorphis virus�, and I am pretty sure that you will feel exactly the same when you get your hands on this brilliant album. By far one of the best releases so far in the year.